Automatic Exchange of Information agreements are made between the UK and other countries. These agreements allow the exchange of information between tax authorities of different countries about financial accounts and investments to help stop tax evasion. Financial institutions, for example, banks, building societies, insurance companies, investment companies, will provide information on non-UK residents with financial accounts and investments in the UK to HM Revenue & Customs (HMRC). HMRC will share this information with the relevant countries and will receive information from other countries about UK residents with financial accounts and investments overseas. The UK has Automatic Exchange of Information agreements under 4 regimes. United States Foreign Account Tax Compliance Act (FATCA) – The agreement between the UK and USA requires UK financial institutions to report to HMRC on US customers that hold accounts with them. Crown Dependencies and Overseas Territories – The agreement between the UK and its Crown Dependencies and UK Overseas Territories to report on those who are tax residents in one territory and hold accounts in the other. Common Reporting Standard – The standard for all automatic exchange of financial information. Directive on Administrative Co-operation – The Directive which applies the Common Reporting Standards throughout the European Union. 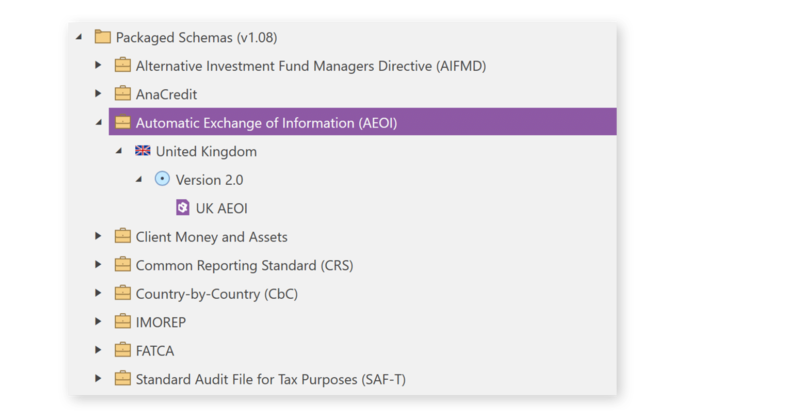 The AEOI Service (previously HMRC FATCA Portal) allows Financial Institutions (FIs) to report to HMRC on interests held by US Specified Persons under FATCA and overseas residents under CDOT agreements and CRS. The UK schema allows the collection of FATCA, CDOT and CRS data in a single report. HMRC will sort and aggregate this data into the correct formats and submit annual returns to the relevant jurisdictions. XML Authority’s intuitive user interface makes producing valid AEOI XML filings easy with little or no training. The user guide provided by HMRC can be difficult to interpret. 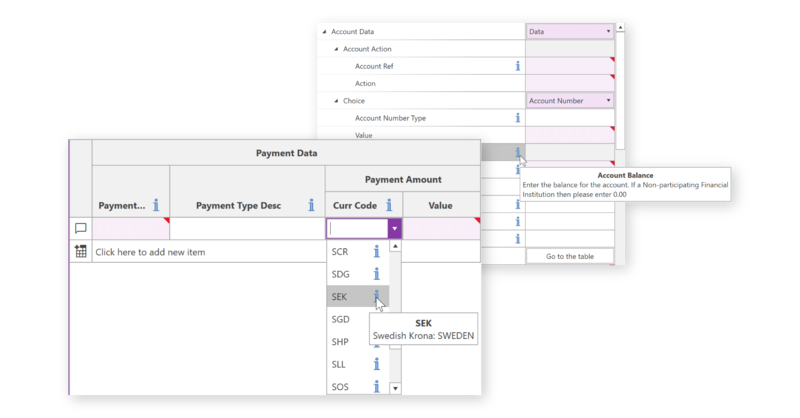 Using XML Authority’s simple presentation of the schema as a set of forms and tables, a detailed understanding of the data requirements can be gained at a glance. 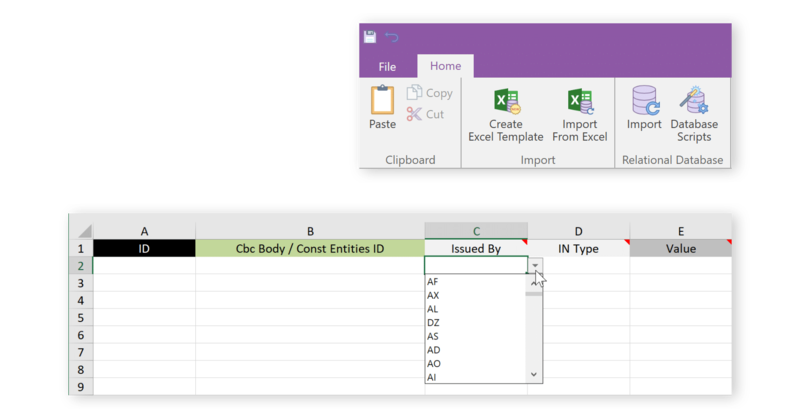 Save time and reduce errors by importing data from XML Authority generated Microsoft Excel import templates or linking to data in relational databases. 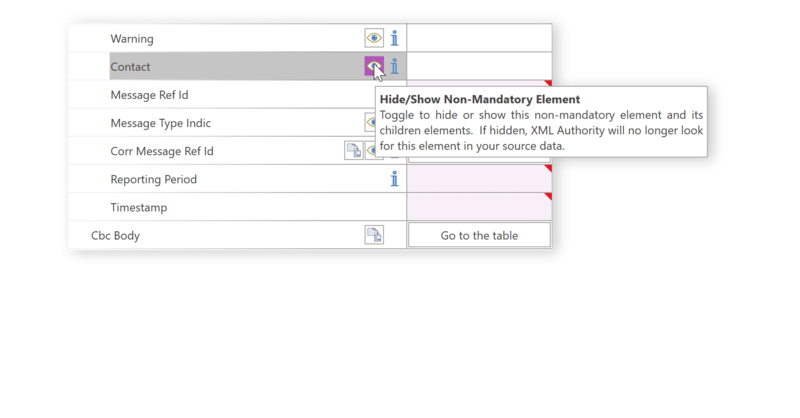 Create a set of related tables from which to read data which conform to the AEOI Reporting XML schema using database scripts generated by XML Authority itself. 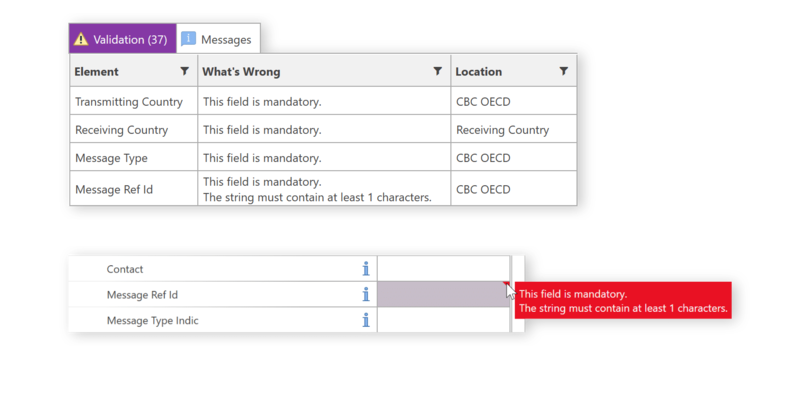 Be assured that your data is in compliance with the requirements of the schema through XML Authority’s validation functionality. 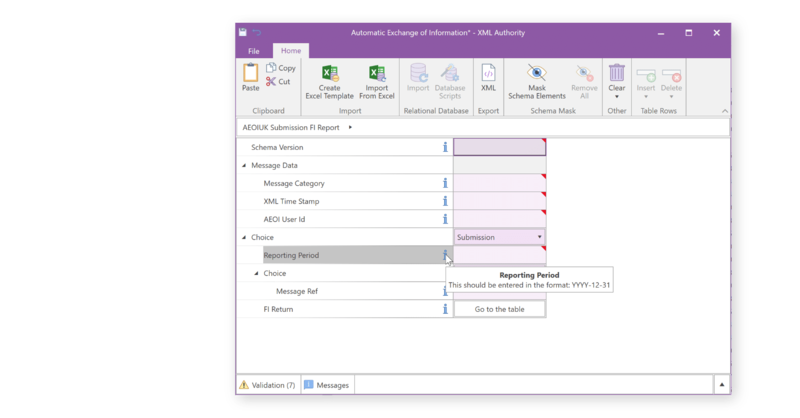 Get real-time feedback on the validity of data input and use the interactive Validations panel to help find and navigate to issues which would cause rejection at HMRC’s submission gateway.